Tuesday, Jan. 14, 7 p.m. MORATORIUM ON SMOKE SHOPS City staff recommends issuing a 45-day moratorium through Feb. 28 on the establishment of new tobacco and e-cigarette retailers, along with cigarette lounges, vapor bars and hookah bars following what a staff report describes as a noticeable uptick in applications for each type of business in Hayward. There is also a gray area within Hayward’s existing ordinances over zoning for these types of tobacco-specific businesses (Item 7). WHAT IT MEANS The city says it needs more time to sort through the proliferation of businesses showing interest in bringing even more cigarette smokers and those craving nicotine in other forms their fix. There’s also the health factor of these businesses promoting the unhealthy vice of smoking to Hayward, already one of the least affluent and unhealthy communities in the East Bay. Ostensibly this moratorium is as much about stopping Hayward children from gaining access to cigarettes and other products like some fruity flavored products currently on the market targeting young customers. If the short-term 45-day moratorium is approved Tuesday, it could be renewed as early as Feb. 18 for another 10 months and 15 days, if staff still requires additional time. BE AWARE A proposal for $1.35 million to lease a new fire engine, eight police patrol cars and four motorcycles will come before the council Tuesday (Item 4). New Hayward firefighters will soon pay up to 15 percent toward the cost of their pensions, under a new agreement (Item 5). NEGOTIATIONS The council will again meet with labor negotiators in closed session. City employees have been without a contract since last February. 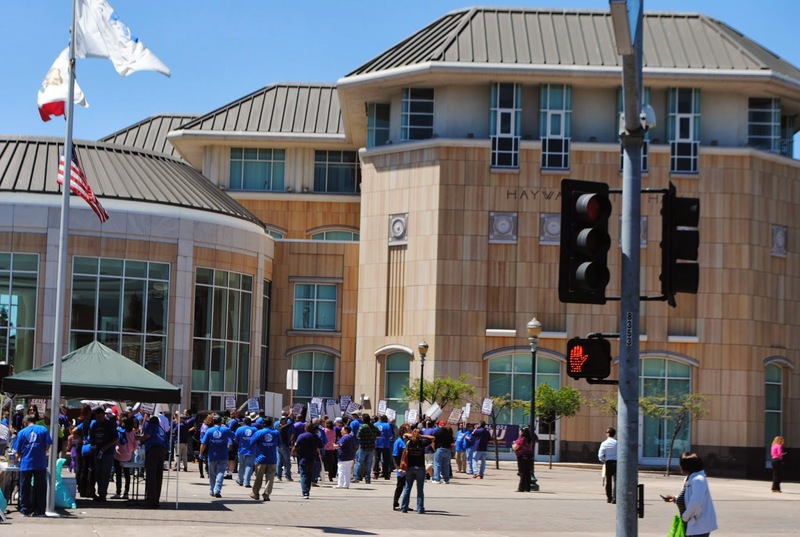 At the last council meeting, representatives for SEIU 1021 presented the council a petition of over 5,000 Hayward residents urging them to negotiate a new contract with the union. Dec. 17, the council finalized an ordinance prohibiting simulated gambling devices in Hayward. Testimony from city staff confirmed a housing developer had illegally cut down a number of trees in the area without a permit. Discussions over the possibility of a tax measure in 2014 for new facilities, primarily a new library and/or police station. Rep. Eric Swalwell addressed the council. Posted in e-cigarettes, Hayward, Hayward firefighters, Hayward Police, Hayward Skinny, hookah bars, moratorium, pensions, smoke shops, unions. Bookmark the permalink. Sorry about the uneven copy. I inadvertently posted the preview and then the WiFi at the coffee shop where I was writing broke down! It's fixed now. 2012 California cities payroll report has just been published on-line by the California State Controller Office. in 2012 Hayward was number one of 479 California Cities in total compensation for the average employee. Hayward was only behind Vernon in average pay, however when the very lucrative retirement and health costs were added, Hayward easily jumped to the top of the 479 California cities reporting. In 2012, there were a dozen City of Hayward employees with a total compensation in excess of $300,000. What I have been hearing about most of the coucil members, excluding Jones and Zermeno is that they are striking down many business opportunities which in hand would bring revenue for our city.. it is a damn shame that they have the mentality that someone out of no where will just toss a bag of millions of dollars on city halls front door step.. The reality of it is that our current council is very non progressive. Its sad only 2 members have business theory and the rest are just people falling asleep at the wheel. when will they learn .. They need to shake things up… Look at all the failed businesses in the last two years… its not a good look hayward, not a good look.. I say we need have a revote for the current council people.. i know we will be having an election but we should also have an election for the current seats taken and see if the people would actually keep these people in…from sweeney, holiday, salinas, marvin and mendal… its sad.. very sad… I dont even have to name call anyone they did it to themselves!! at the figures and the positions they occupy. Why do you bring this up. Those are the top jobs, not the rank and file. Why do entrepreneurs want to do business in Hayward if it's so unfriendly to small business? The referenced web site above now lists 480 California cities with their compensation averages and that for each position. Hayward has 863 employees which an average wage of $96,122, retirement/health care costs of $37,220 for a total compensation of $133,342. The date includes over 130 part time or partial year positions, including the City Council members. The total average compensation is the highest of the 480 cities reporting. In 2012 the highest compensation went to the Youth & Family Services Administrator; $285,241 wages, benefits $32,069 for a total annual compensation of $317,310. The City Manager was approximately 15th on the list in total annual compensation. There were 148,756 residents in Hayward, and the web site shows that in 2012 the cost of City of Hayward employee total compensation was $774 per resident. The Youth and Family Administrator makes over $285,000 a year in wages alone. Are you kidding me. That position supervises less than 10 individuals, does not put his/her life on the line like our local police and firefighters, runs what considered to be a “non-essential” service that many non-profit agencies do without much less often using volunteers to do the “counseling” and crisis intervention. I think the City Council needs to look at that department and either cut the pay drastically, or contract out to a local non-profit to do that job. From my experience I observe quite a few new businesses in the downtown area. There's always two sides to the story.